Have a Father's Day Gift Basket delivered to their door and put a smile on a well deserving father! Get Father's Day gift ideas for dads that love sports, the outdoors, backyard grilling or simply a delicious assortment of gourmet snacks. 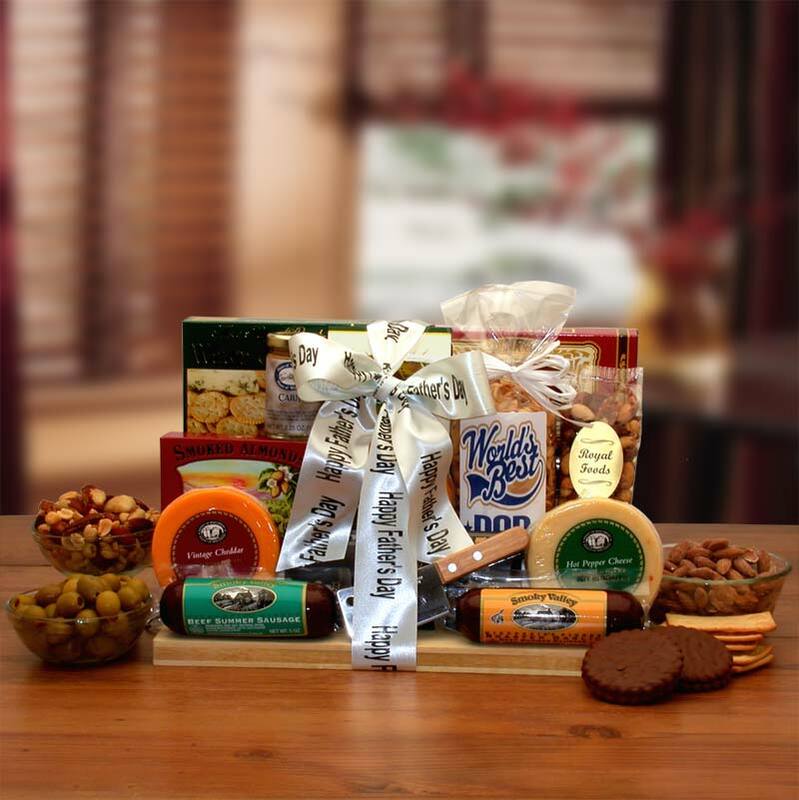 We offer a large selection of deliverable themed gourmet gift baskets...all with free ground shipping! included with all of our Father's Day Gift Baskets! Wilderness Lovers Outdoor Gift BoxWe've got their back in the outdoor back country. The Wilderness Lover's Outdoor box includes a unique combination of useful survival tools as well as delicious treats for their journey into the outdoors. Whether their an avid outdoorsman or just a weekend warrior they're sure to appreciate your thoughtfulness is sending a gift tailored especially for them. Motorcycle Man Snacks Gift BasketWeekend warriors and die hard motorcycle fans alike will love this motorcycle themed gift basket. Filled with exceptional detail and charm, these motorcycle mementos will be cherished for years to come! Jim and Jack Together Grilling Gift BasketTwo true classics together at last. Jim Beam and Jack Daniels have teamed up in this delicious assortment of grillin goodness. The delectable sauces and marinades will add zest to any steak or chicken cook out. Even those who don't drink will love the zesty flavor of Jim's Steak Marinade and barbecue sauce.